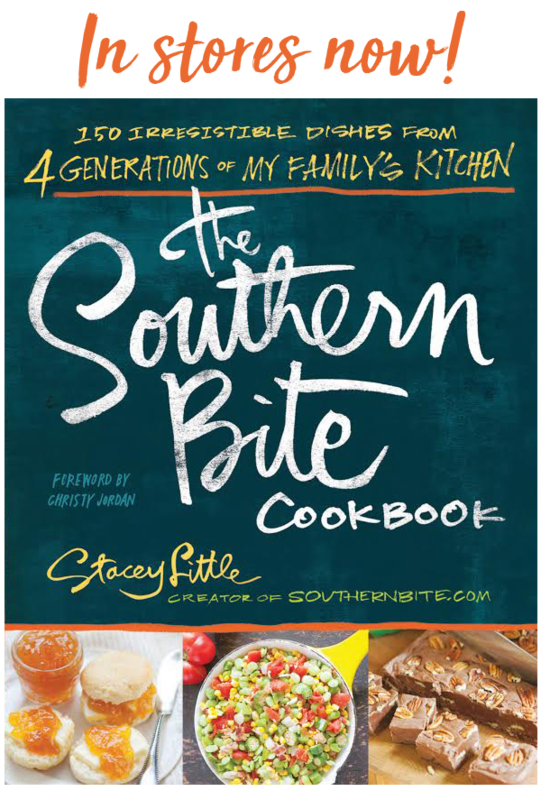 This is one of my MOST FAVORITE recipes on SouthernBite.com. It’s so flavorful and super easy. Parboiled rice, also sometimes called converted rice, is rice that is par-cooked with the husk on. Cooking it with the husk on forces a little of the nutrients from the husk into the grain that would ordinarily be lost when the husk is removed. While parboiling it seems like it would cook faster, it actually takes just a few minutes more to cook over regular long grain white rice. But that’s not a big deal in this case. The real reason I like to use parboiled rice is the end product it yields. When it is parboiled, it removes a lot of the starch from the outside of the rice. This is a good thing. When it’s added to recipes and cooked through, you’ll end up with individual grains of rice in the dish rather than a sticky mush that sometimes results from using regular rice in a dish like this. Can you use regular rice? You bet! But I much prefer the parboiled/converted in this recipe. I think you will too. Heat oil in a large dutch oven over medium-high heat. Add the sausage and chicken and cook, stirring frequently until the sausage has browned - about 5 to 8 minutes. Spoon the meat out of the skillet with a slotted spoon leaving the remaining oil in the pot and set the meat aside. Add the onions and pepper and cook, stirring frequently, until the onions are translucent - about 5 minutes. Add the garlic and cook until fragrant - about 1 minute. Add tomatoes with juice, tomato sauce, red pepper flakes (if desired), bay leaves, broth, creole seasoning. Bring to a boil. Stir in uncooked rice and return the chicken and sausage to the pot. Stir well. Cover and reduce heat and cook about 20 minutes - stirring occasionally - or until rice is tender and most of the liquid has been absorbed. YUMMMMY! Looks so good and so easy too! I will be making it real soon! Thanks! Yup, that’ll do it. You have my apcaipirteon. 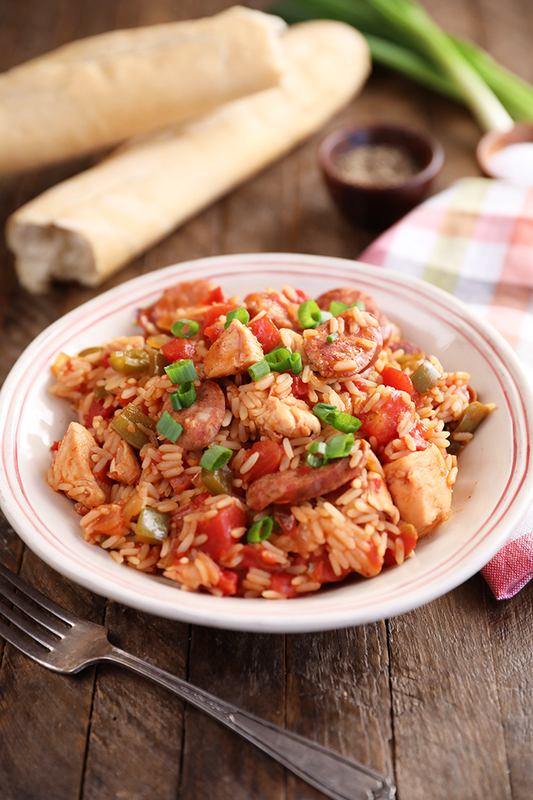 Where do you get andouille or cajun sausage OR what is a good substitution? Have been wanting to try something like this or etoufee’, but can’t seem to find the sausage in GA, maybe I’m just not looking in the right place! There are only a few places I can find it here, but you can use any smoked sausage like kielbasa. That will make a perfect substitution. I think you must be looking in the wrong place. In Alabama it is in the grocery stores. Making this for supper, can’t wait. Just had to add that I’m using Conecuh sausage too. The best sausage in the WORLD! Awesome! I hope y’all enjoyed it! Hi Robb! It depends on portion size and whether you’re serving this as a side or a main course. If you’re serving as a main course, I bet you could easily feed 5 or 6 folks. is the can of diced tomatos drained or not? Add the entire can, juice and all. I hope y’all enjoyed it, Kristen! I have this cooking, & it smells amazing. 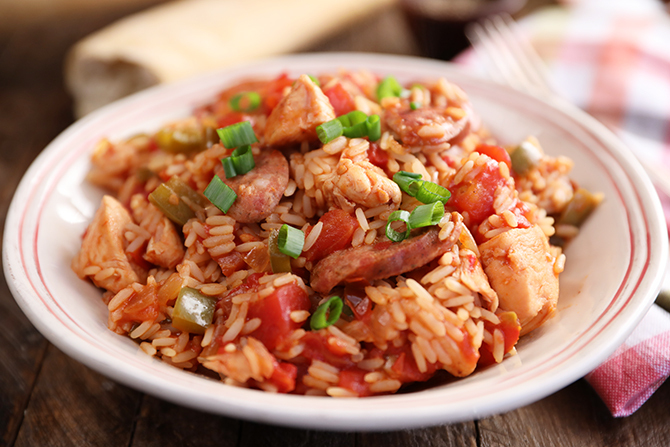 Let’s see if a Canadian girl can cook up some Jambalaya. Thanks for sharing! Ooooo, I hope y’all enjoyed it!! Thanks for sharing! Fantastic recipe. I personally added additional bell peppers, half a hebenaro, and more fresh diced tomatoes. I also poached my chicken in a cajun broth before pulling it and adding to the rest. Although not the entire same, this was a great starting point. ADDITIONAL: You can find most of your “Cajun” andullie sausage at your local grocery store next to your ave johnsonville italian sasauges. Awesome recipe! I made this today; it was so simple and very flavorful. 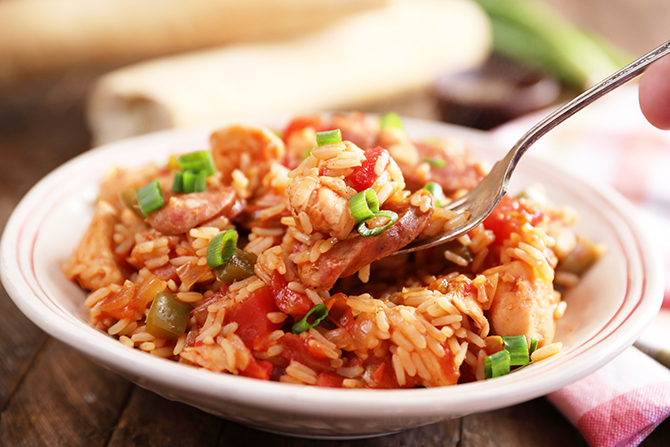 I used brown rice and turkey sausage with extra Creole seasoning in mine…so yummy…thank you for sharing your recipe. I look forward to trying others you have available. Sounds delish! So glad it turned out well for you. 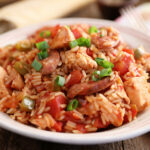 This was my first time making Chicken & Sausage Jambalaya & it was so easy to make and tasted delicious. Wonderful!! I’m so glad you liked it! So if I were to get six serving out of this, how big would the portion size be? I have comfortably fed six folks with this recipe, though I’m not sure on the exact portion amount – it’s not huge, but plenty. I’m just not sure there is a substitute. In a medium bowl combine paprika, dried oregano, ground black pepper, dried basil, kosher salt, cayenne pepper, granulated onion, dried thyme, and granulated garlic. Stir to combine. Store in an airtight container for up to three months……. Delicious! I’ve never made Jambalaya before so was kind of nervous. I doubled the recipe and fed 10 firefighters with it. They left that table full and happy, compliments to you for the recipe! Well that’s quite the compliment there! Glad it turned out well for you! Serving size? I don’t want to make too much and end up having to throw most of it away. I don’t include serving sizes for lots of reasons. What might be a serving to one person, might be a side to another. Nonetheless, this recipe makes a lot – probably enough to very comfortable feed 6 people. what kind of creole seasoning would you recommended? I have a very similar recipe I got out of a TASTE OF HOME Magazine a few years back,but I plan on making your recipe soon. 🙂 I am blessed by your remarks at the beginning of your recipes. I’ve never done that. I’m hesitant to recommend it because the rice could get way overcooked. Great news! I’m so glad y’all enjoyed it! Thanks so much!! I hope you find lots and lots you enjoy!! That’s so strange. Yes, I would absolutely recommend adding more stock if you’e having the problem. You can also bring it to a boil, add the rice, then reduce the heat. SO sorry to hear you’ve had trouble. This was absolutely delicious! We used conecuh sausage since it’s our favorite and it was perfect. Thank you, it’s a keeper! Awesome!! SO glad you enjoyed it!! Hi! Have you ever tried to make this in advance and freeze it? Thanks! I haven’t, but I think it would work just fine as long as it is cooked completely before freezing. Quick question – how large of a dutch oven will it take to fit this recipe? Thank you! I usually use my 5 to 6-quart. Great! Used the 5.5-qt and it fit perfectly. I recently moved to Oregon from Baton Rouge, and thanks to this, I was able to treat my friends to a recipe from my home. Absolutely a winner! Thanks so much for the answer, and for the recipe! So great to hear, Maggie!! I’m tickled everyone enjoyed it! I am from North Louisiana. I’ve never had Jambalaya! I don’t like spicy cajun foods. But, this looks really good. I’m wondering what kind of side dish and bread goes with this? I am going to make this for supper. 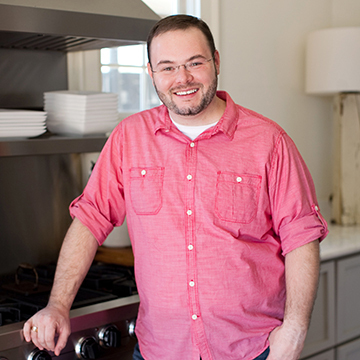 Thank you for sharing recipes with us. I usually just do it with some garlic bread and a salad. Enjoy! I tried this recipe today and after 45 minutes, the rice as still slightly crunchy. I added another 1/2 cup of water to it hoping it will turn out. It was a lot of work for it not to be good. 🙁 Does high altitude have any impact on cooking rice? we live in Denver. Thanks. HI Jenn! Oh, I just hate to hear you’ve had trouble. Yes, high altitude will cause you to need to add some additional liquid. The additional 1/2 cup should be just fine. That said, it’a slo important the make sure the liquid os boiling before you stir in the rice. Hope that fixed it for you. I’ve made this a couple times and the only question i have is about the rice. I have used minute rice and it almost comes out like oatmeal. It is still delicious. Should I be using something other than minute rice? I started cutting back on the amount of chicken broth and the overall cook time to help keep the rice from getting mushy. Since minute rice is parcooked, it doesn’t need a long cook time. This recipe is best with regular uncooked rice. You can certainly reduce the broth a bit and only cook it until the rice is cooked to your liking if you opt for the minute rice. 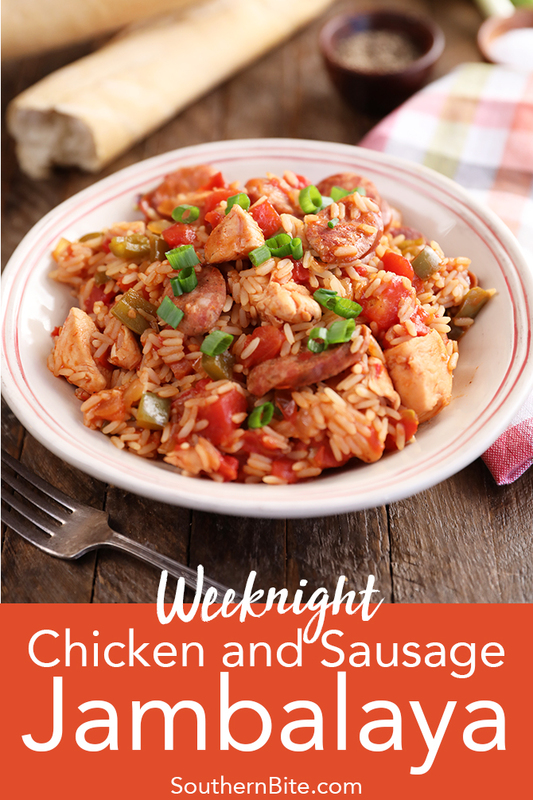 When I read this recipe, I couldn’t find any instructions as to when to add the chicken and sausage back into the rice….. did I miss something? It sounds yummy! I would like to make this using riced cauliflower for a Lo carb meal. Would I use the same amount of liquid? Any Lo carb tips? Thank you. That’s just not something I’ve worked with, so I can offer much help. Maybe someone else has trie it and can chime in.